Piper McCloud was always going to be a baby that lived up to her surname. As a baby she floated – just inches above her cot, but floated and her parents were ashamed of her and her being ‘different’. What would the neighbours say? They kept her home, out of sight. When she finally turned five and still floated clear across a room her parents finally admitted the truth to themselves ‘Seems like our child ain’t normal is all I’m saying,’ Betty McCloud told Doc Bell. It was decided that ‘home school’ was the best decision. But you can’t keep a girl who wants to fly down and that day had to come when Piper would launch herself off the roof and take to the sky. 'Piper decided to jump off of the roof. It wasn't a rash decision on her part. She loves flying with a passion, flying across town and to the hills beyond. Sadly, the neighbours saw it and what with them hating anything that wasn’t normal, someone told someone and before you know it the ‘Government’ turns up and little Piper is taken from her loving farmer parents to a special school for ‘different’ kids deep below ground. The unfortunate acronym of the school is I.N.S.A.N.E. where Piper is introduced to other kids with extraordinary skills. Piper meets kids who can see through walls, move objects with their eyes or even make rainbows and beautiful rare plants grow. She loves this place, but she has to promise the ‘Head’ Dr Hellion never to fly and that upsets her greatly. Pretty soon she discovers that no one else is allowed to be ‘special’ either and this school being underground an all is taking on the appearance of being a ‘prison’. Piper herself is entirely likeable, a tad naïve, she hates to see injustice anywhere and she is desperate for friends having been denied any for so long. 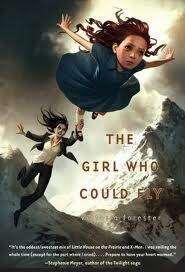 Told with wit in a southern style that is sometimes outright hilarious in the beginning, but increasingly grows darker as the story of Piper McCloud and her wish to fly progresses, it is entirely captivating. The other children she meets from the mean Conrad and the excitable Bella are excellent creations, contrasting well with the scary ultra reasonable Dr Hellion who runs the Institute. You can’t keep a girl like Piper McCloud confined for long and this story is a gem. Perfect for the 12 plus range with real dangers. One hopes that there will be more tales of Piper and her extraordinary friends very soon. *Compliments too to Jason Chan who did the wonderful book cover. Surely one of the best cover artists working in the USA today.